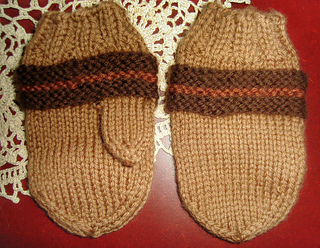 These little mittens are knit in wool. Thumb fingers are worked behind rather than the side of mittens pouch. Materials: Scraps of Knit Pick Swish DK (100% superwash merino wool) 123 yards/50 gram ball; about half ball of Doe or color of your choice, scraps of Bark, and Copper or color of your choice.